I have driven the Bentley Bentayga. It is good and fast and expensive, covered in acres of leather and crystals. But when I drove it, one very key factor was missing from the experience. I wondered, what the hell am I supposed to do with my falcon? At last—at long, long last—Bentley has an answer for me. Thanks to Mulliner, Bentley’s personalization division, the Bentayga can be had with equipment to transport and loose my falcon, Michael Ballaban Jr. 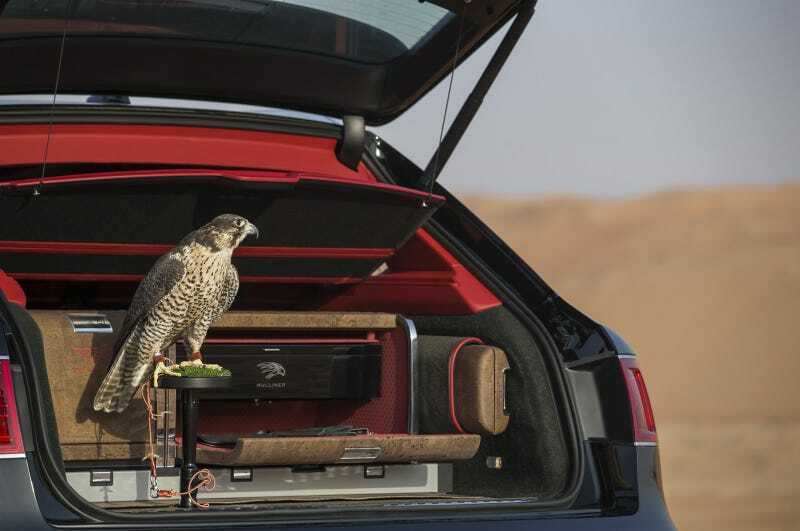 It is called the Bentayga Falconry, and Mike Jr. and I are goddamn thrilled about it. He told me so. Did I mention he can talk? At the heart of the Bentayga Falconry by Mulliner are two individual natural-cork-fabric-trimmed units: a master flight station and a refreshment case. These sit on a movable tray that allows for easy access. Inside the master flight unit is a special Piano Black veneered drawer – with a saker falcon crest – containing bespoke storage for all the equipment required for this unique sport. Beneath this is a laser-embossed Hotspur hide stowage tray with individual compartments for a GPS bird tracking unit, binoculars and hand-crafted leather bird hoods and gauntlets, all of which are available as an additional option. The refreshment case houses three metal flasks and durable cups, a blanket and refreshing face cloths. A perch for the falcon. A GPS bird tracker. All my falconry gear, and some flasks. At last, I’m getting what I pay for in a Bentley! It’s good news for me as well. No longer must I carry Mike Jr. around in the back of an old Ford panel van with a vertical rod I welded to the floorboard. This is how I will loose Mike Jr. into the skies, to send messages, feast on small woodland creatures and assail my enemies. And knock over liquor stores. He does that. If he’s done it to you, I apologize. Bentley doesn’t say how much this package for the Bentayga costs. If you have to ask, you and your falcon can’t afford it. Mike Jr. and I aren’t too worried, what with the robberies and all.